The new 18-V GARDENA Rain Water Tank Pump is setting new standards in the gardening world. It operates entirely free from the mains power supply, so now you can pump water using Li-ion battery power. Thanks to the new battery-powered GARDENA Rain Water Tank Pump 2000/2 Li-18, pumping high-pressure water has never been easier. It operates without connection to a mains power supply, making this pump particularly flexible. Smart garden lovers save money by using rain water in the garden, which is free of charge after all. With the GARDENA Rain Water Tank Pump 2000/2 Li-18, you can now easily use and pump water that has been collected, without being connected to the mains power supply. The angled aluminium telescopic pipe allows you to pump water collected in the water tank to use with GARDENA spray guns, sprayers or sprinklers to water the plants. It does not matter where the rain barrel is positioned or where the nearest power socket is, because the 18-V Li-ion battery means that the pump can operate completely independently. During operation, the battery hangs from the rain water tank or stands on the ground. This makes the pump extremely flexible. With three power levels to choose from, you can adjust the pump performance to suit your needs. This means that the pump can operate for up to one hour with just one battery charge. The special supporting foot with integrated filter system prevents dirt particles from being sucked up and ensures smooth operation. With a pressure of 2.0 bar, the powerful pump quickly and reliably supplies up to 2000 litres per hour. Its compact design makes it particularly portable and easy to use. It not only works well as an irrigation pump, but also as a flat-suction clear water submersible pump. For example, you can use it to drain small ponds, flooded boats and garden showers — wherever water needs to be moved flexibly. The battery technology makes all of this possible, without requiring a connection to the mains power supply. 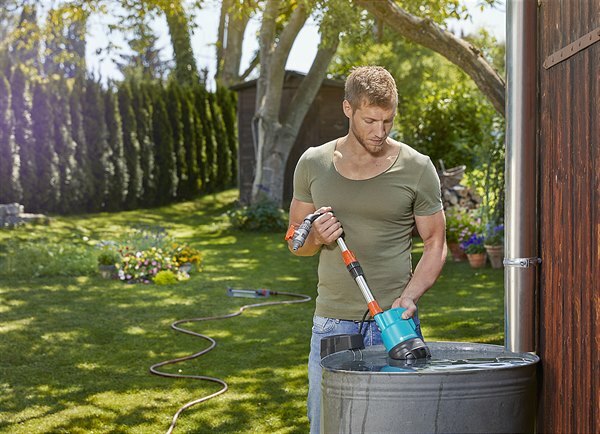 The new Rain Water Tank Pump joins the GARDENA HeartBeat System — GARDENA's range of battery-powered devices. All the devices from this system can be operated with the same 18-V battery. As 2019 marks the 40-year anniversary of GARDENA pumps, all pumps sold in 2019 will come with a 40-month warranty.